This product will add 1.21€ to your cashback account. In 2007, Eric JOnes released a set of lecture notes intended to be an homage to his idol, Stevie Wonder. The notes included magic targeted for laymen that magicians seemed to enjoy as well. 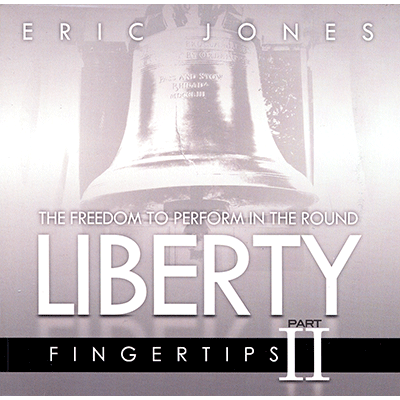 Liberty is the follow up to Fingertips Part 1 with more magic and tips for the trade that will help make you a better magician and expand your magic arsenal of sleights and routines. All of the routines listed in this section are intended to be done surrounded, so you have no angle considerations. A most visual 2 phase 2 card transept available without gimmicks. This really looks like trick photography! A color changing deck for the 21st century. A signed selection changes color, then the backs of the entire deck change and all can be given out for examination. A real cooler. Eric's slick handling of Chad Long's Oil and Water. this one is a perfect opening phase for your favorite Oil and water routine. As it appears in Oiater, a manuscript containing visual versions of Oil and Water, here's Eric's hybrid of Oil and Water and Cards Across. A multiple phase coin and bottle concluding with the Spectator being able to put the coin in the bottle. Plunge is simple, yet devastating. This is a minor impromptu miracle. Borrow a coin, Borrow a hat and let the fun begin. But the party doesn't stop there! In the Bonus Section, Eric includes two items that while can't be done surround, will help free your mind and encourage your creativity. A one hand top change for the new millennia. You will have to see it to believe it! A spellbound change that takes place on the outstretched hand. Visually change a coin into a key, finger ring, a piece of candy or any other small object.